Waterlogged: Tales from the 7th Sea, Cloudscape Comics‘ 7th graphic novel anthology, has finally gone to the presses, and in a few weeks the printed hardcover books will be shipped to us. It was a project I was very heavily involved on: I wrote two stories, edited five, organized and edited the “Gallery of Pirates,” and copyedited the whole book. Whew! A lot of fun though also lot of work and by the end, very stressful, when tempers were frayed and I was obsessively hunting over the manuscript again and again to see if there was anything left to be changed (my perfectionism rearing its ugly head). But now I can stop worrying about it and merely wait for its return with baited breath. I think it’s our best anthology so far, combining the strengths of our two previous books (the professionalism and craft of 21 Journeys with the fun and bonus features of Giants of Main Street). It includes stories by both many classic Cloudscape veterans (Jonathon Dalton, Jeff Ellis, Colin Upton, Angela Melick…) and great new participants (Nina Matsumoto, Sam Logan, Lucy Bellwood…). I’m proud to be a part of it and I look forward to showing it off to everyone I meet. 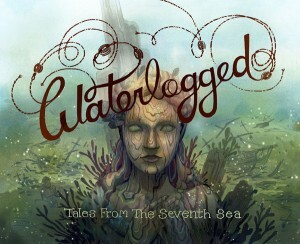 This entry was posted in Event and tagged anthology, Cloudscape Comics, Waterlogged. Bookmark the permalink.